After an impressive two game stretch against Davidson and George Mason, the Massachusetts men’s basketball team had a rough outing in Washington D.C., falling to George Washington 79-67. Even with the return of leading scorer Luwane Pipkins from injury, UMass (9-17, 2-11 Atlantic 10) had a poor offensive showing, scoring just 25 points in the first half while going 10-for-27 from the field. The Minutemen held a 14-12 lead with 14:58 left in the first half, but things went downhill from there, as the Colonials (8-18, 4-9 A-10) went on an 18-4 run to take control of the game. “Not a very spirited performance,” UMass coach Matt McCall told WEEI after the game. “Not tremendous effort by any means by our guys which continues to be a theme as we’ve marched through this year. For me, still trying to figure out the buttons to push with this group has been frustrating. Again, I’ll take ownership in everything with where we’re at. Defensively, the Minutemen had their issues slowing down the George Washington attack, as the Colonials shot 66.7 percent in the first half, finishing the game with going an impressive 27-for-49 from the field. Like many other times this season, McCall was displeased with his unit’s effort on the defensive end of the floor that allowed George Washington to consistently get good looks on the offensive end. UMass was able to chip away at the Colonial lead in the second half, getting it to as close as nine points with 8:23 to play, but George Washington would go on a 12-2 run to ruin the Minutemen’s hopes of a comeback. Carl Pierre led UMass with 14 points, while Pipkins chipped in 13 off the bench. Maceo Jack led the Colonials with 20 points and Armel Potter (19), DJ Williams (15) and Justin Mazzulla (12) joined him in double figures. With the loss, UMass drops to last place in the A-10, a place that has become too familiar throughout league play but was not expected at the start of the year. A frustrated McCall is unhappy with where the program currently sits, and is running out of answers as the season dwindles to a close. 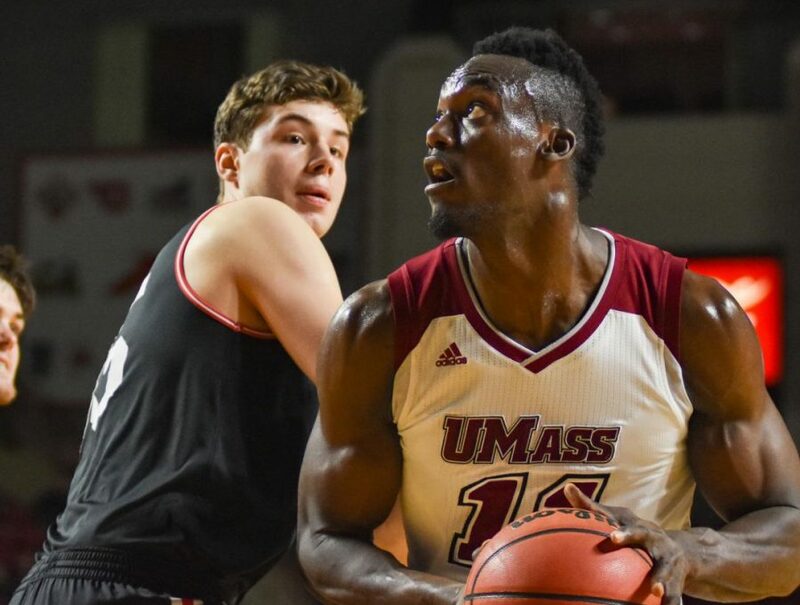 The Minutemen have five games to correct themselves before the A-10 tournament opens in Brooklyn, but the problems with UMass have been rooted in effort and execution. The Minutemen currently sit three games out of the 10 seed in the A-10 with five games to go, making it a long shot of not having to play in the opening round of the tournament. McCall feels the culture will have to change if they want any shot of not playing in that opening round. UMass is back in action Saturday, taking on Saint Joseph’s at the Mullins Center. Thomas Johnston can be reached at [email protected] and followed on Twitter @TJ__Johnston.